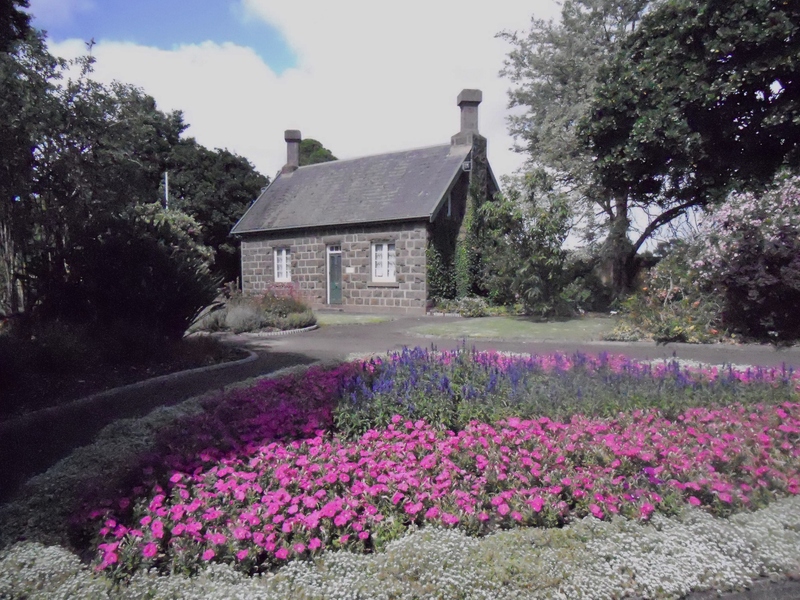 The Western District has many historic botanic gardens, most established from the 1850s to the 1870s when it was the thing for a town to do, if nothing else, to keep up with the neighbouring town. 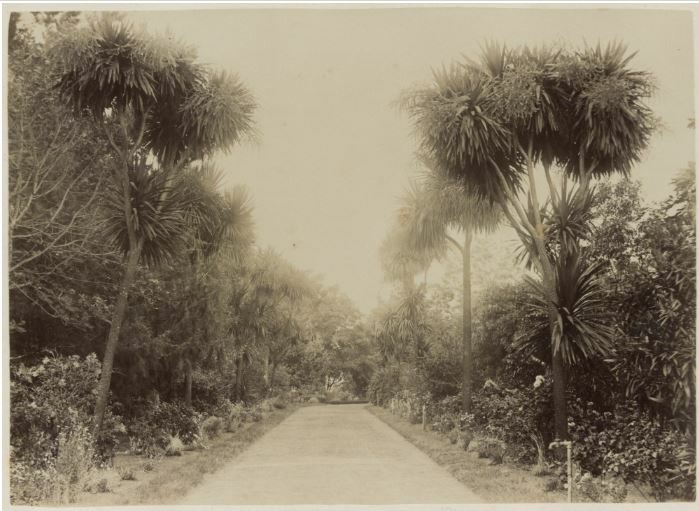 For some it was scientific purposes, to acclimatise plants and sometimes animals, as with the Hamilton Botanic Gardens. 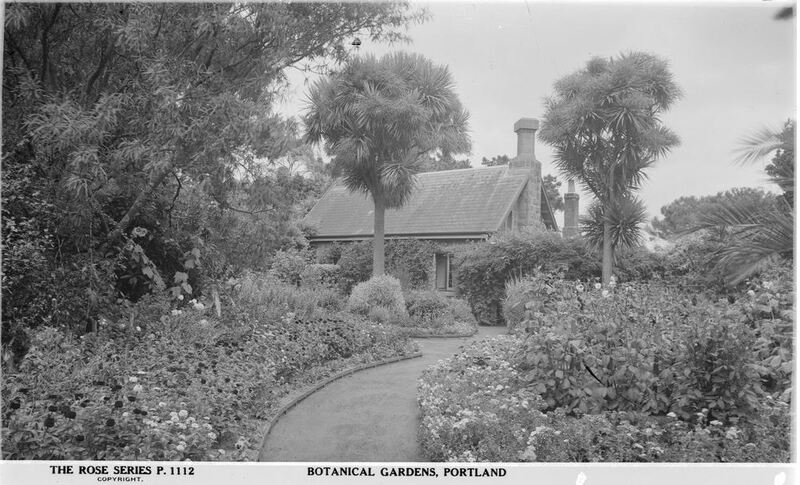 There is a sense of history walking through each garden and the tall specimen trees such as oaks, redwoods and pines whisper the tales of times past. 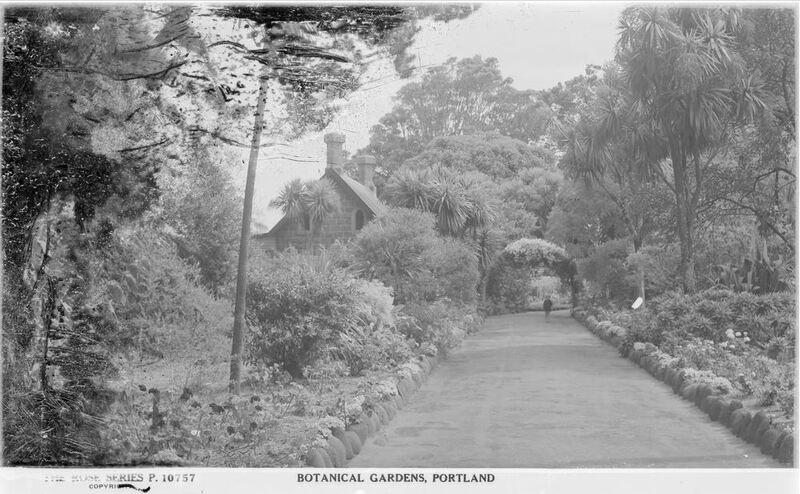 The Portland Botanical Gardens, like the rest of the town, ooze history. 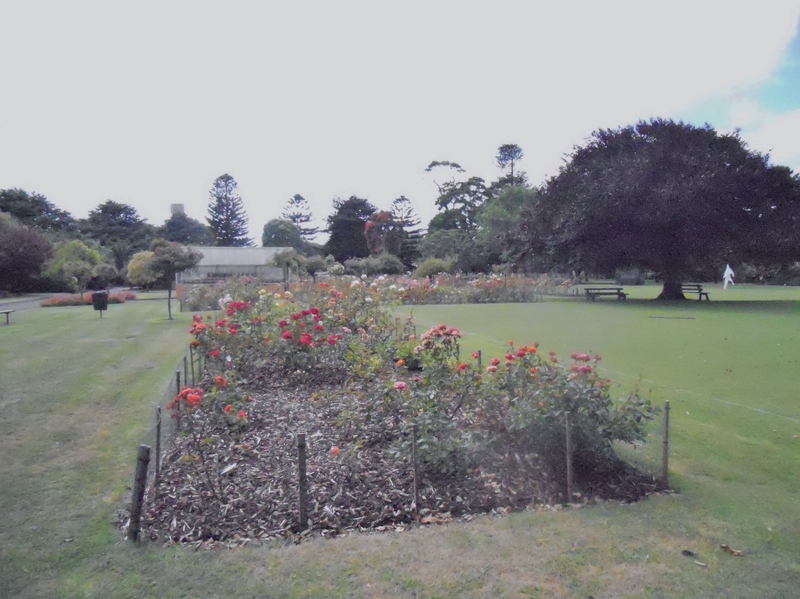 Each botanic garden is unique in some way and Portland is no different and is unlike other gardens I have visited including Hamilton and Geelong. 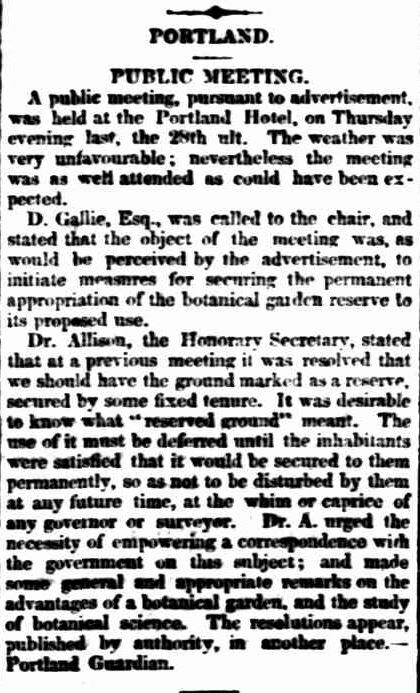 Land for the gardens was first marked out in 1851, but it took a few years of public meetings for the gardens to be established. 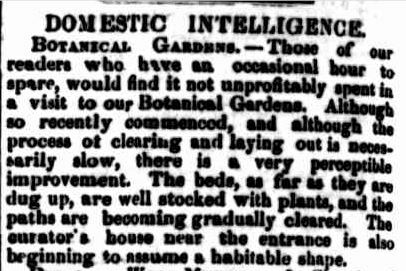 In 1853, the Honourary Secretary remarked on the “advantages of a botanical garden, and the study of botanical science”. 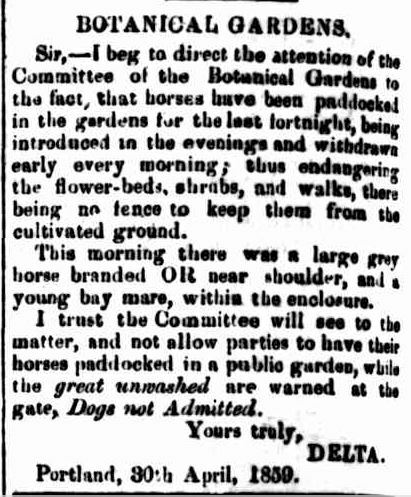 At a public meeting six months later, on February 4, 1854, chaired by James Blair, Stephen Henty proposed that a committee be formed to get the gardens up and running. 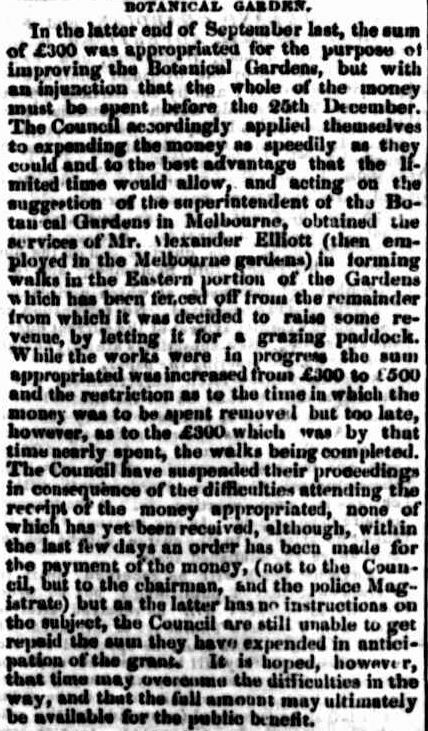 Works began in 1858, assisted by Alexander Elliot from the Royal Botanic Gardens in Melbourne, however, a lack of funds was slowing progress. 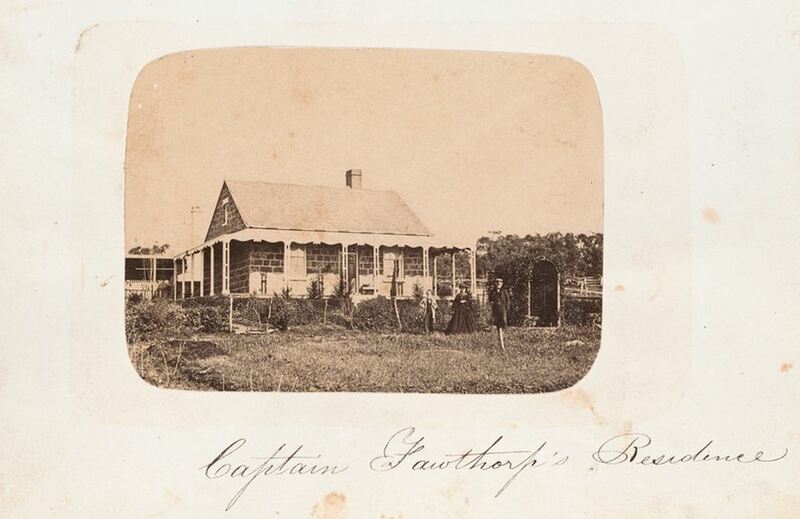 By November however, the gardens were beginning to take shape and the curator’s cottage was under construction. If you visit the Portland Botanical Gardens, look up at the tall trees and think of those that planted them or as you walk the paths consider the hands that carved them. 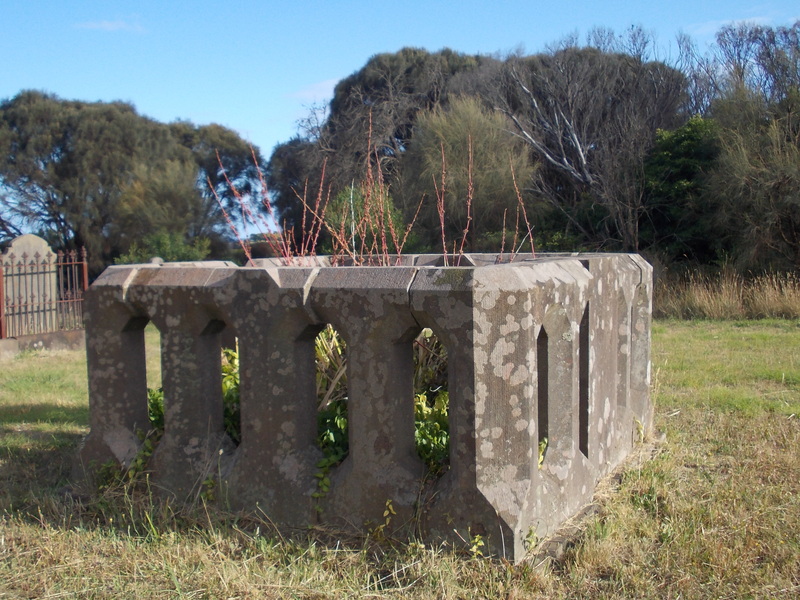 The story behind these features is my favourite story about the gardens. 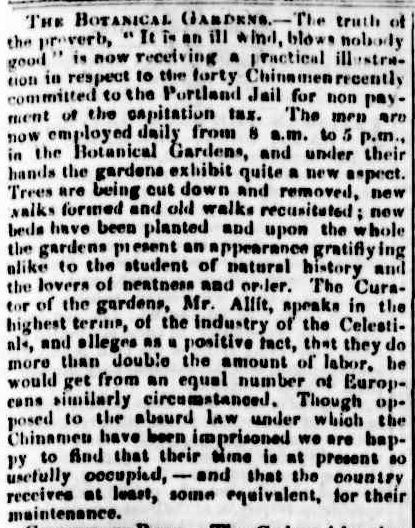 At a meeting of the Portland Historical Committee in 1932, the secretary told the story of the Chinese prisoners and their work at the Portland Botanical Gardens. 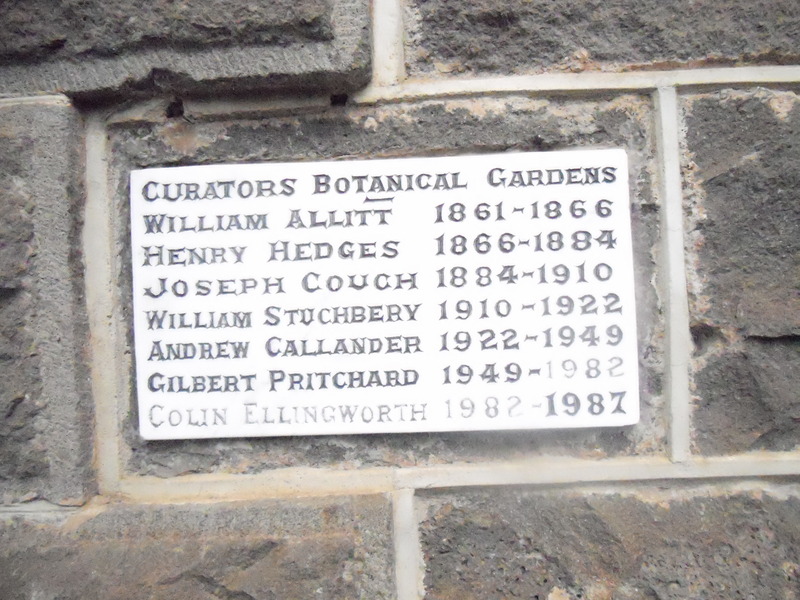 On the wall of the curator’s cottage is a plaque recognising previous curators of the gardens from the kindly William Allitt in 1861 through to Colin Ellingworth, curator from 1982-1987. 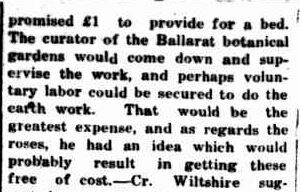 Andrew Callander was curator from 1922-1949. 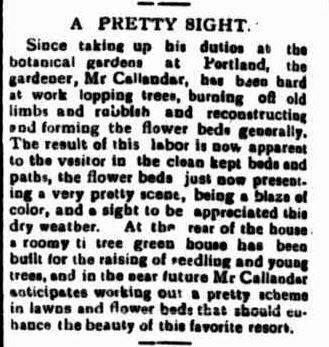 Upon his appointment, Mr Callander set about tidying up the gardens and building a ti-tree green house for seedling propagation. 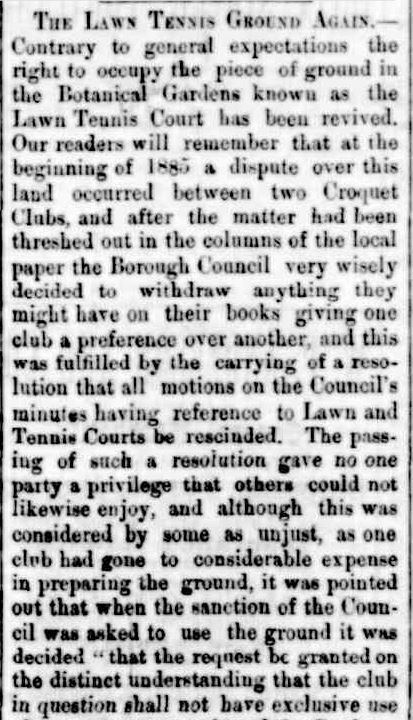 At one time both croquet and tennis were played at the gardens and there were often tensions between the two groups and any other group that hoped to share the space. 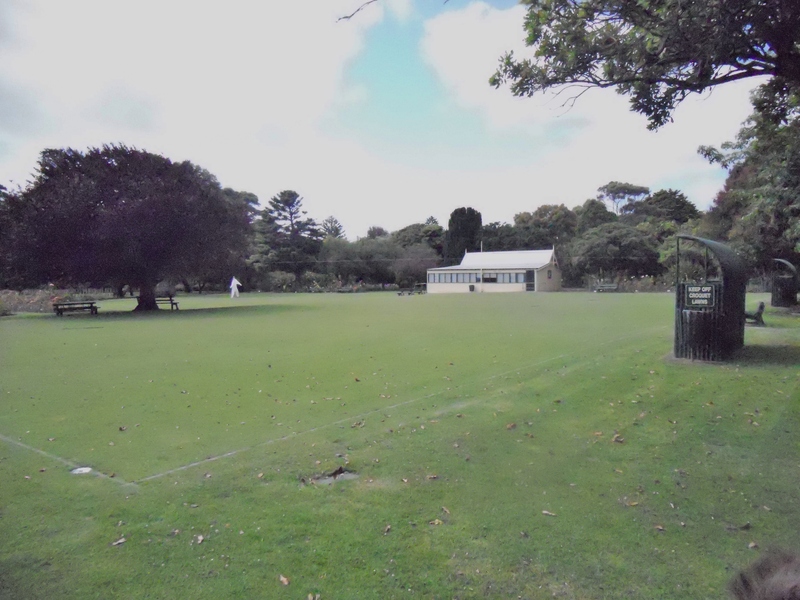 Croquet won out and is still played today. 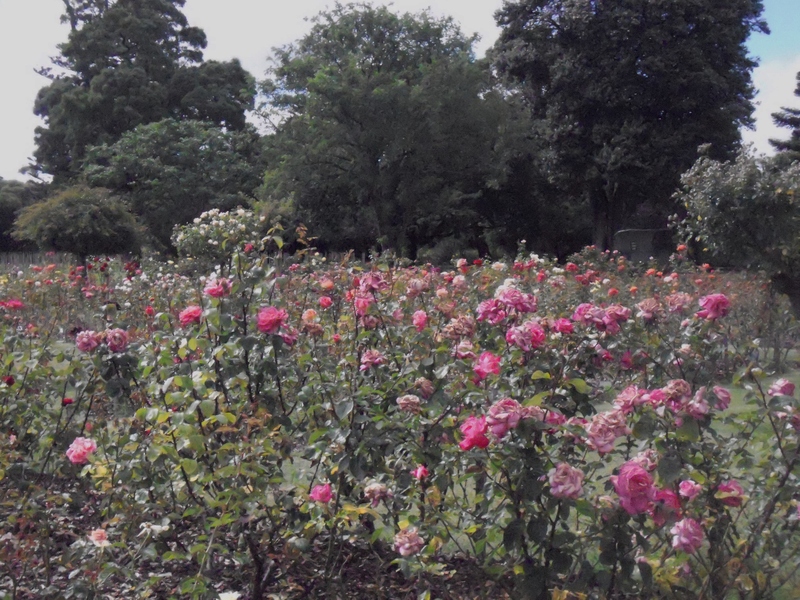 The tennis courts were converted to rose gardens. 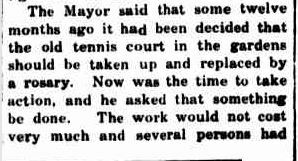 The rosary was first proposed in 1930 but it was 1931 before there was further action. 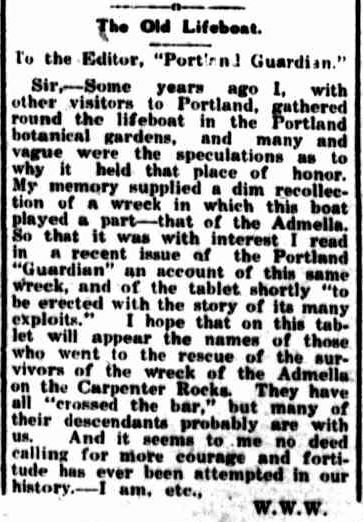 “Wandering Willie’s Wife” visited the Portland Botanical Gardens in 1926 and felt compelled to write a letter to the editor of the Portland Guardian on the subject of a nameless lifeboat on display in the gardens. 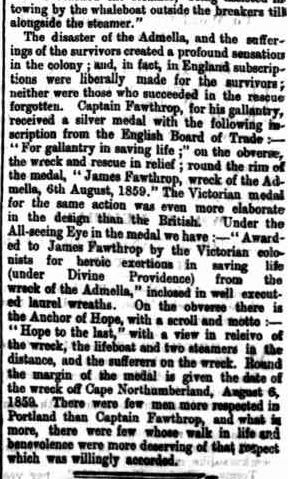 Could it have been the lifeboat, captained by James Fawthrop, used to rescue survivors from the wreck of the S.S. Admella ? 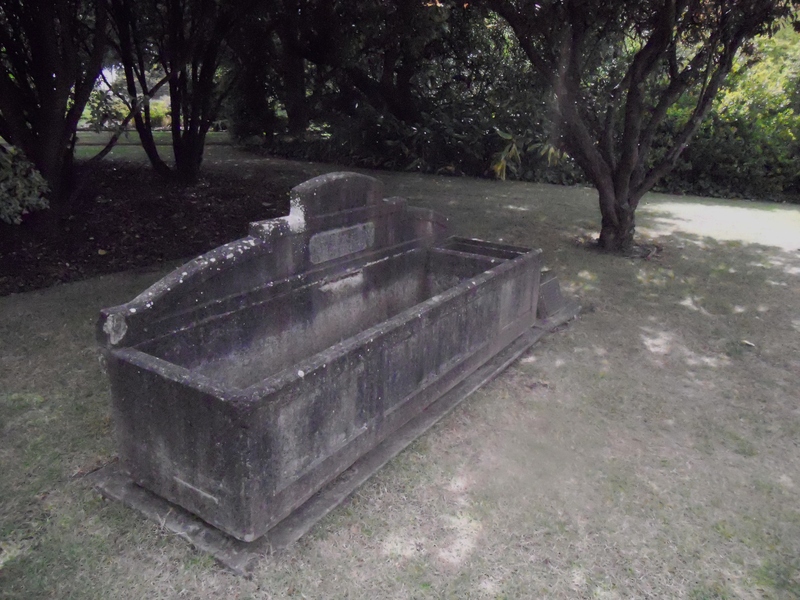 Why wasn’t there a name plaque? 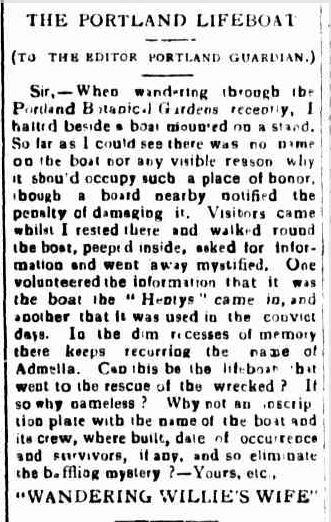 Three years later, “Wandering Willie’s Wife” wrote to the editor again, prompted by the announcement that a “tablet” with the story of the lifeboat Portland would be placed beside the boat. 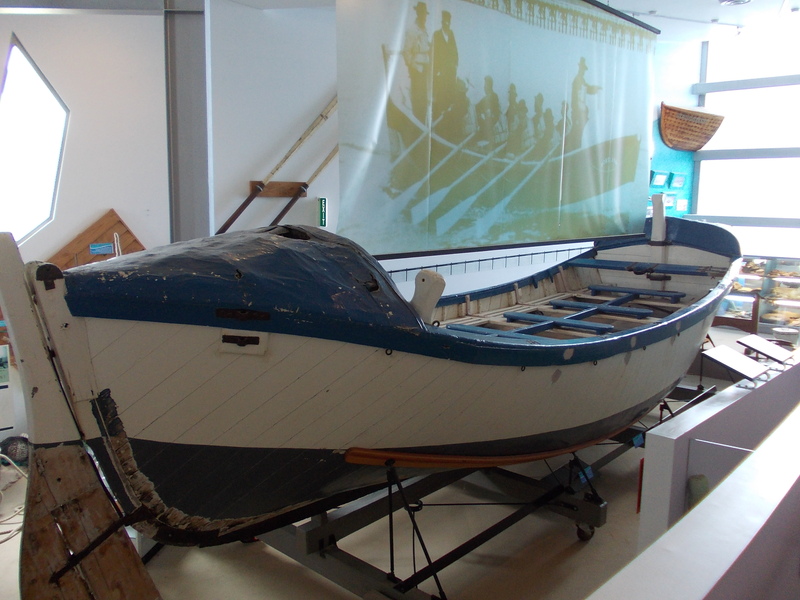 The lifeboat is now removed from the elements and is housed in the Portland Maritime Discovery Centre. 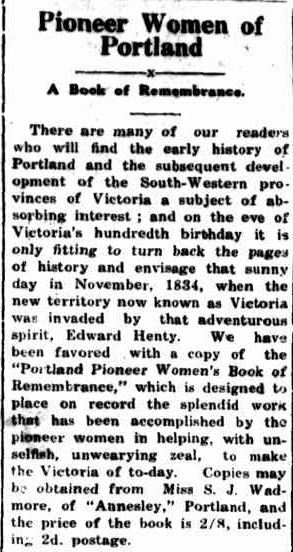 The obituary of Sarah Jane Wadmore in the January Passing of the Pioneers prompted me to find out more about a booklet she co-authored for the Portland Centenary in 1934, the Portland Pioneer Women’s Book of Remembrance. 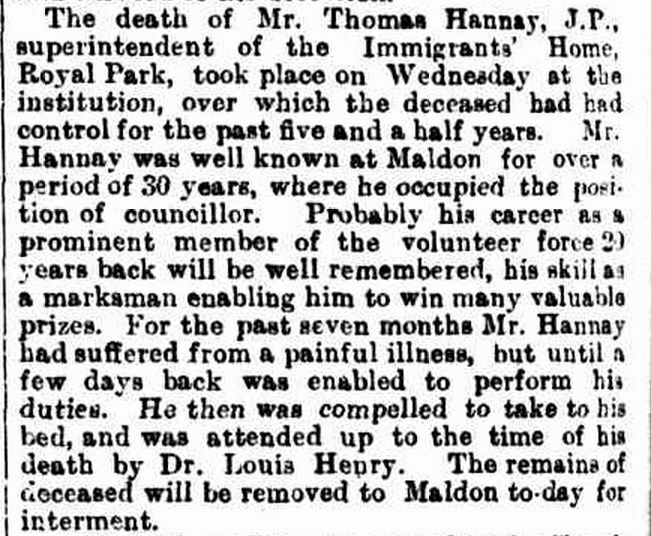 I had previously read about it in newspaper reports from around the time. 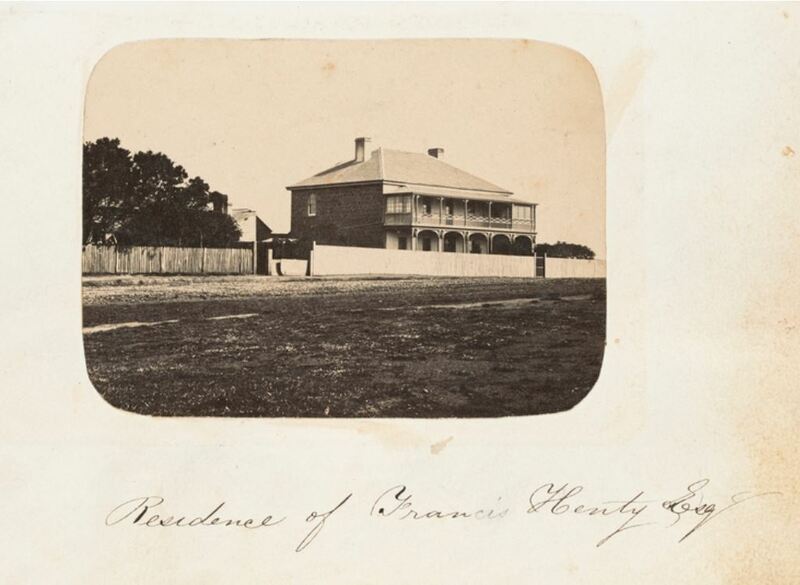 A Google search led me to the State Library of Victoria website and it was pleasing to see it has been digitised and is available online. 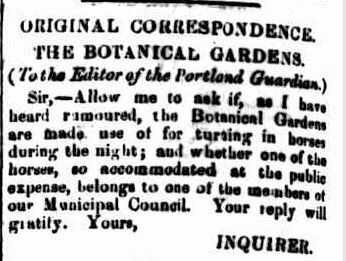 I was even more pleased that ggg grandmother Margaret Ann Diwell (nee Turner) was among the pioneering women of Portland as well as some of those I have featured in Passing of the Pioneers. The booklet begins with a forward from Alice Frances Moss, a pioneer of women’s rights. 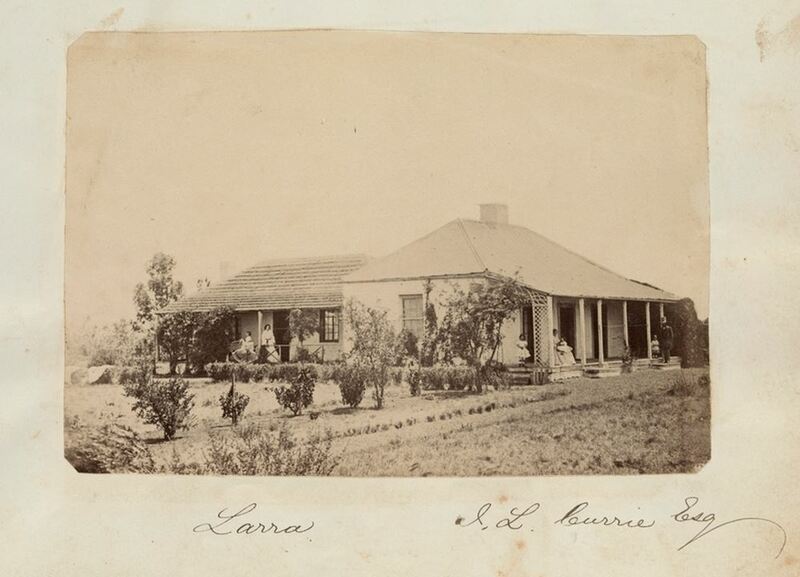 She was the first President of the National Council of Women of Australia and Chair of the Victorian Women’s Centenary Council. 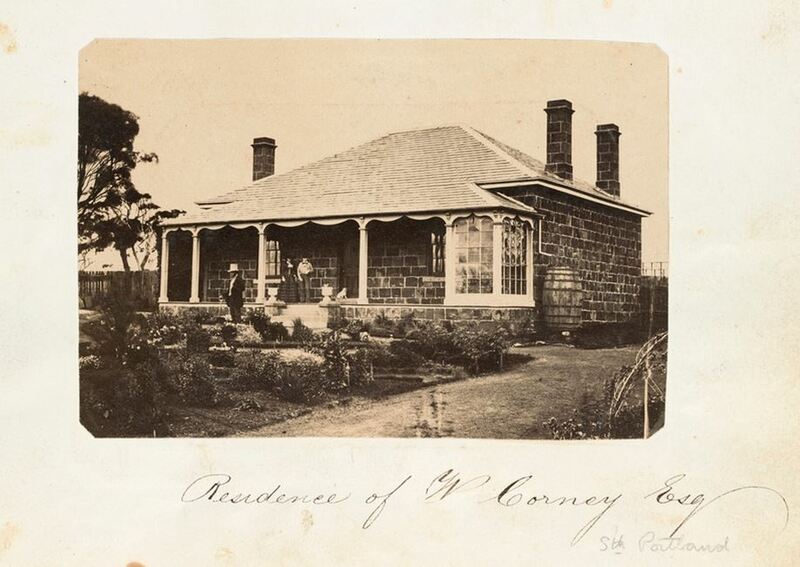 After an offering of appreciation to pioneer women, there is the story of Mrs Stephen George Henty, the first European woman at Portland, to whom the booklet was dedicated. 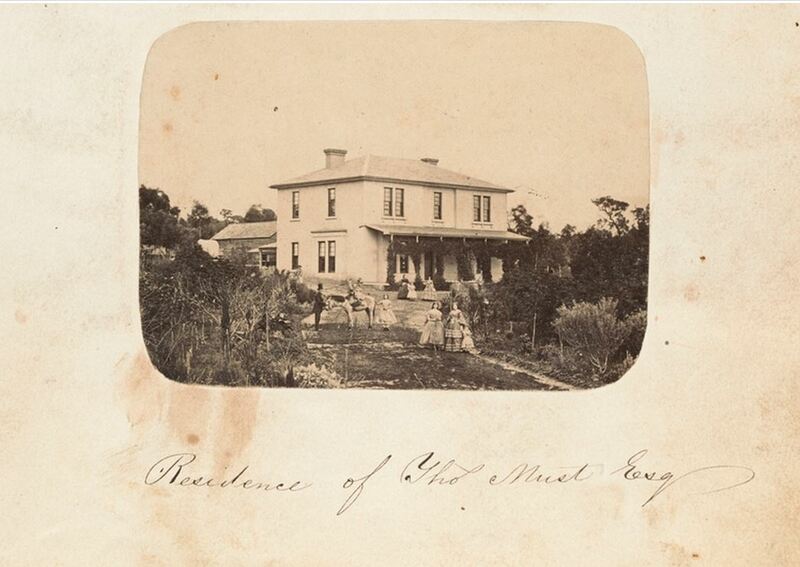 She is often called Mrs Stephen George Henty, but let us call her Jane (Pace). 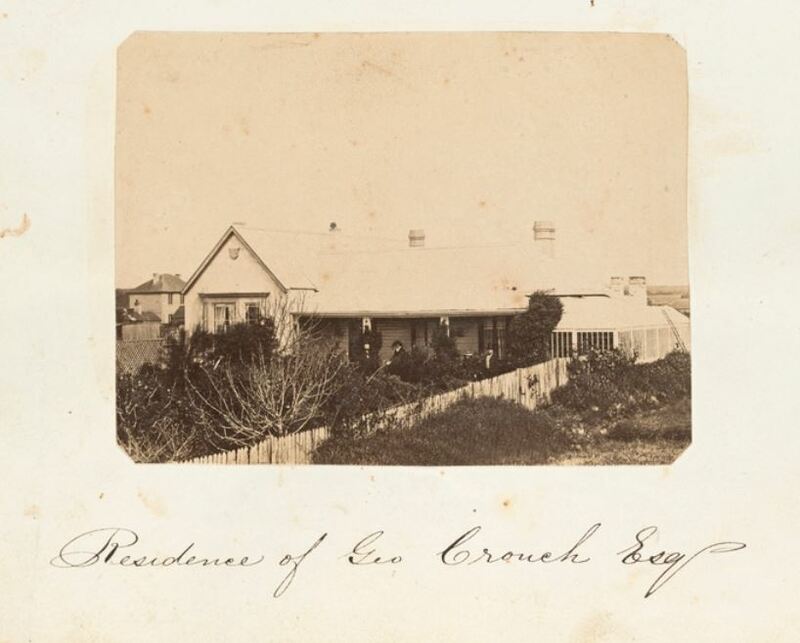 There are the recollections of Mrs George Godwin Crouch (Marianne Trangmar) spanning from 1840 to 1917. 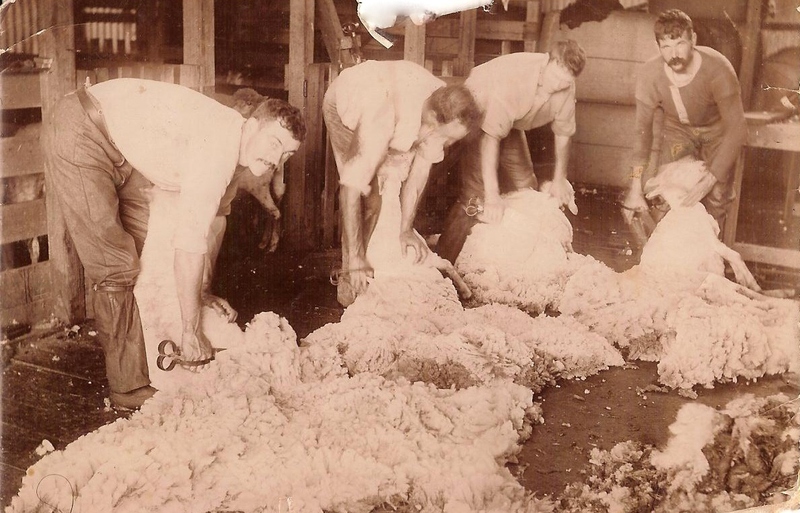 Then, a list of “Worthy Pioneers” compiled by Sarah Jane Wadmore. 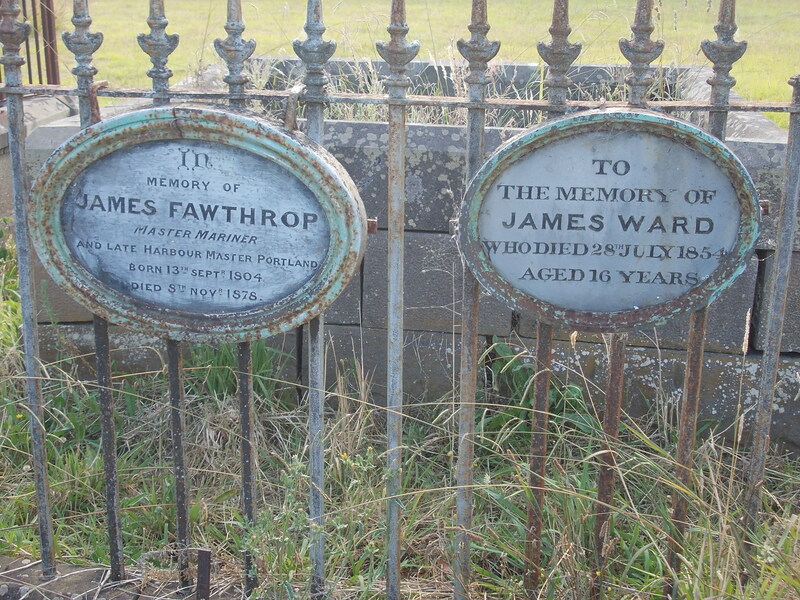 Included is one of my favourites, Rebecca Kittson (Mrs William Lightbody) and Mrs Fawthrop, Jane Rosevear, wife of Captain James Fawthrop the life boat captain. 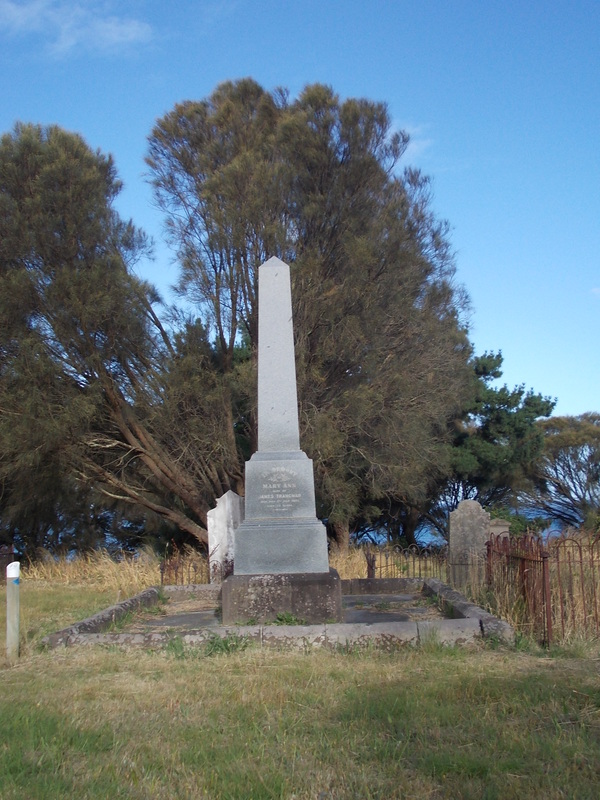 Following is the story of Mrs Richard Charlton Hedditch and further on, a letter she wrote on Christmas Day 1848, to her parents in England. 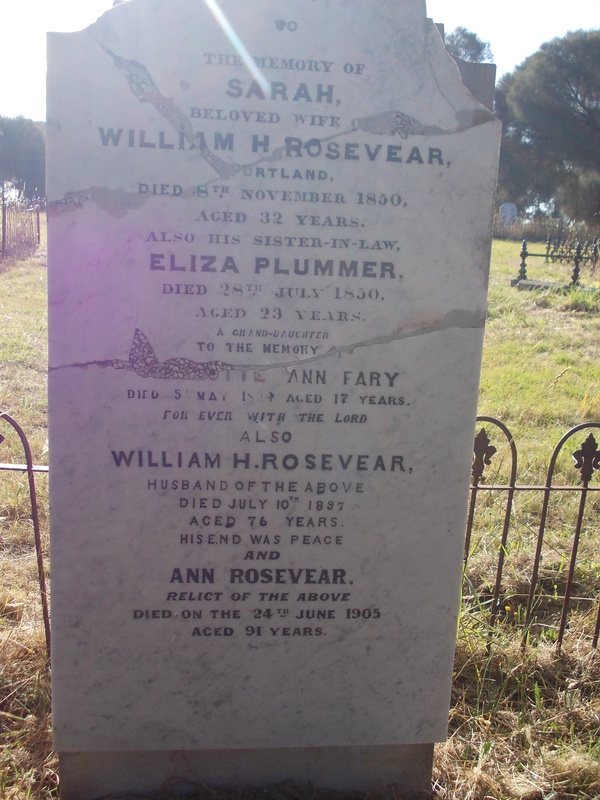 Another woman often referred to by her husband’s name, she was Rachel Forward Read. 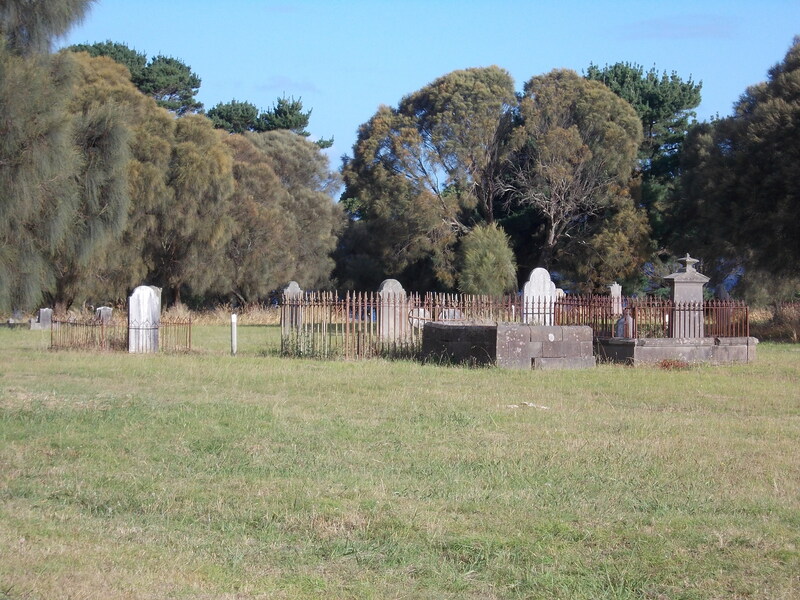 After some local poetry comes “Belles and Beauties of the Early Days”. 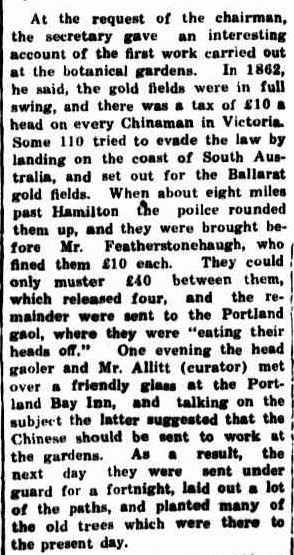 Those included are Misses Henty, Learmonth, Trangmar and Herbertson. Finally is a list of Portland’s Pioneering Women. 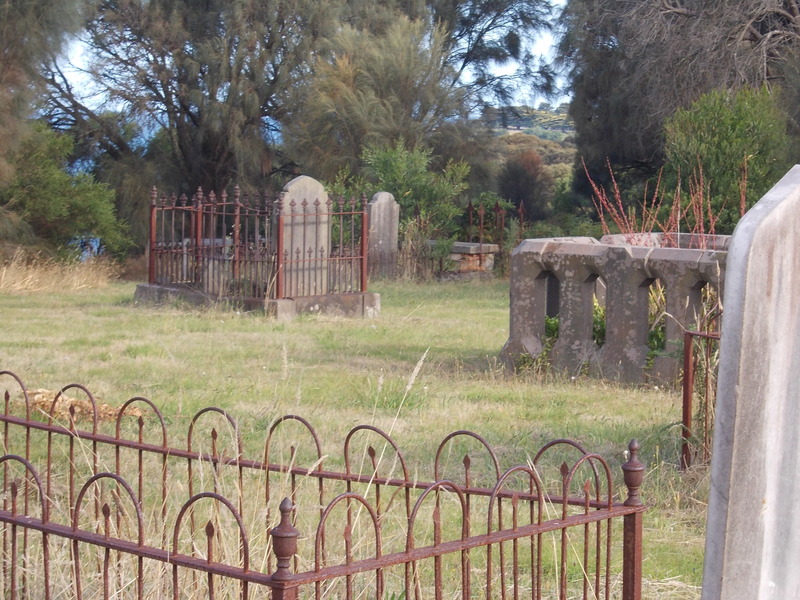 Women born or living in Portland prior to 1864 were eligible. This is where I found Margaret. 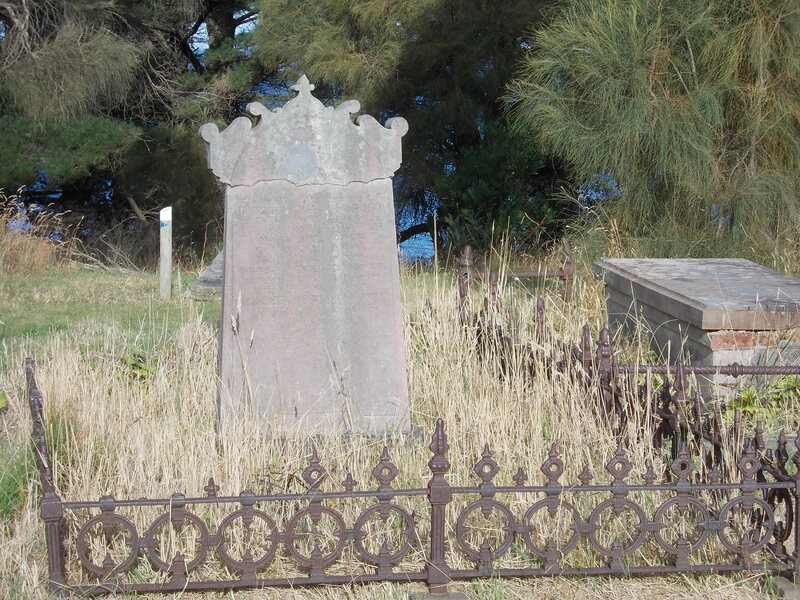 The Diwells lived in Portland for about five years from the time of their arrival on the Duke of Richmond in 1852. 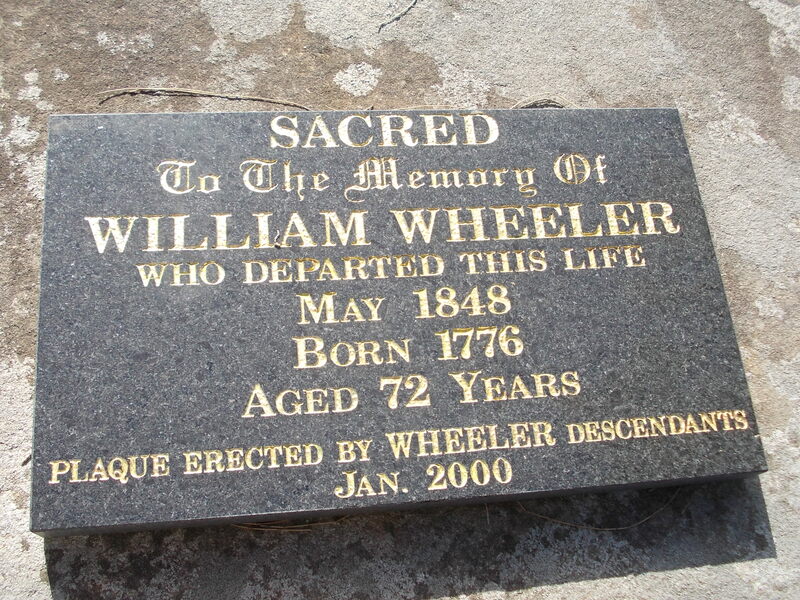 Margaret appears as Mrs William Diwell and her daughter-in-law, Frances Webb, is also listed as Mrs William Diwell. 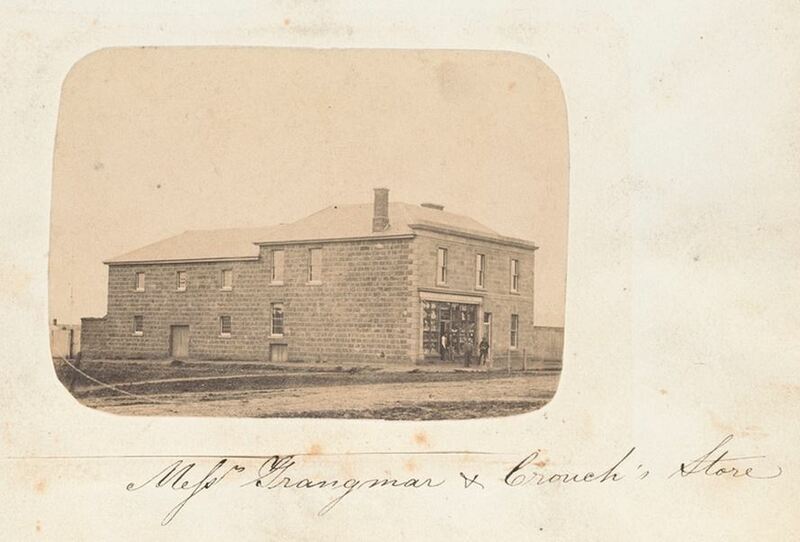 Frances just scraped in as she was born in Portland in 1863 to John Webb and Margaret Smith, who is also listed. This is a useful list as some entries have notes and maiden names. 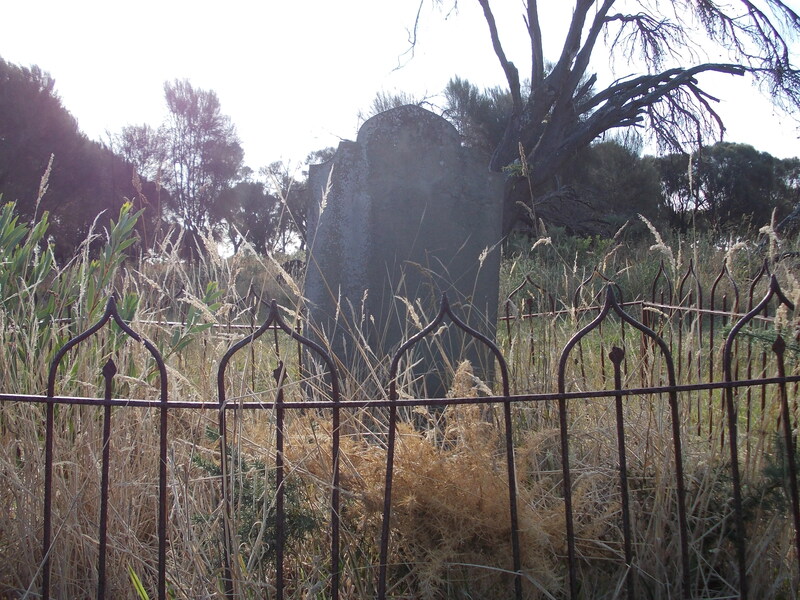 The oldest pioneer women, recognised separately, include Marion Nunn Jones, Emma Holmes and Anne Beglan. 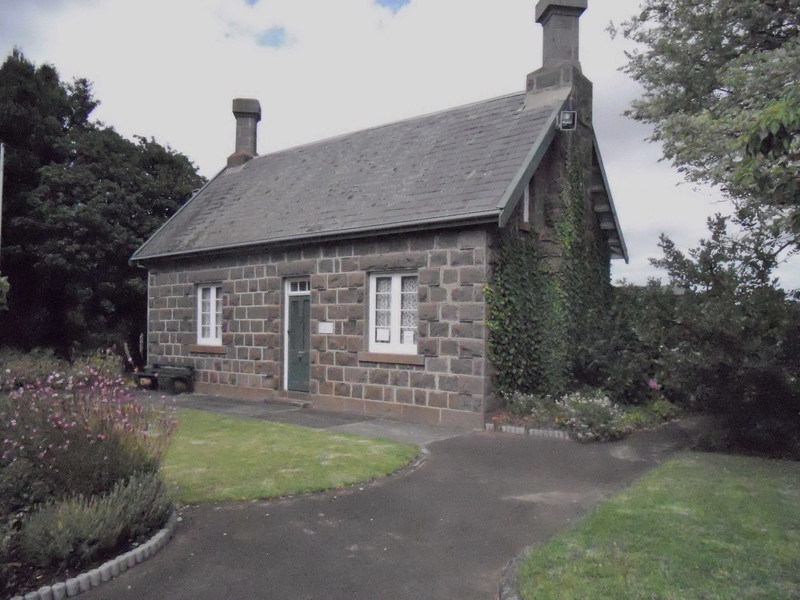 The photographs in the booklet are of Mrs Jane Henty, Mrs Marianne Crouch, Mrs Janet Laurie, Sarah Jane Wadmore and Mrs Rachel Hedditch. 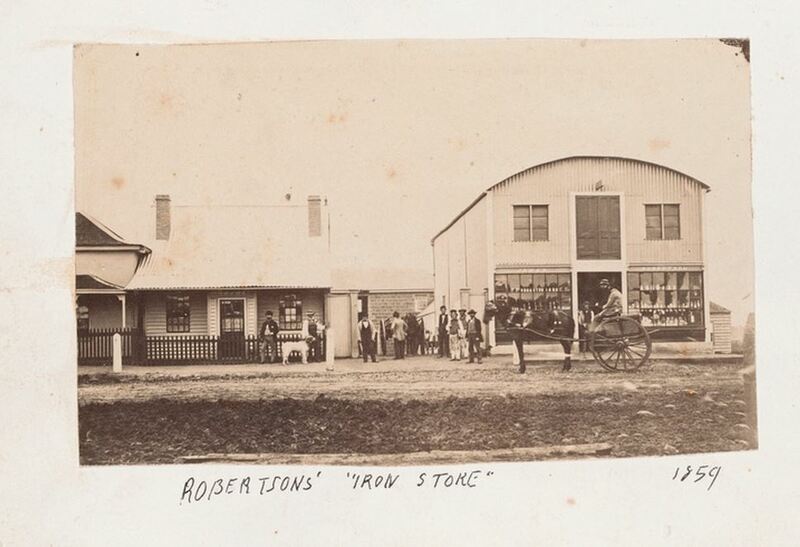 The booklet also comes as an Archive CD book and is available from the Genealogical Society of Victoria.